I also offer one off discounts, special offers and last minute deals so please get in touch to confirm accurate pricing. REMEMBER: The money spent on a planner could work out paying for itself with industry discounts, best value suppliers and key individuals at venues. The most new and upcoming service in the event industry. Coming from the city that never sleeps - New York! Wedding proposal planning can help you plan the engagement between you and a loved one. Whether its a luxury penthouse in the city of London or a helicopter ride. I can make this happen. Think outside the box and let me help conduct it - so you can enjoy the moment. Have a hidden photographer to capture this wonderful moment. Book a free consultation today to discuss what you would like and how I can make this as magical as possible. I love a challenge. I can fit to all ideas, themes & colour schemes. Whether celebrating 1 year, 2 years or 60 years. Each anniversary is a milestone occasion and should be one to remember and celebrate. Whether you are having a intimate do with family or a big celebration with friends. I can help. I can offer various types of events which can even be from the comfort of your own home. From exclusive tea parties to big karaoke nights. Anything is possible! So why not book a free consultation today and explore all the options you have. As every event I offer is personal and bespoke pricing can be discussed at a consultation. Remember, a good event planner can save you money & stress. Email, ring or text to find out more. Need that extra helping hand.. This was a house warming dinner. A lovely spring feel. Getting married is the most happiest day of your life. So why make it a day of stress? Booking a free consultation can show what I can offer you as well as opening up what you may not think is possible or have the time to do. All the little details you won't have to worry about! Find out more and what i can offer. Make it the best day ever.. It's always the little things with Charlotte Randall - special event planner so please get in touch to get those finer details. Wedding bouncy castle available for full or part day hire. 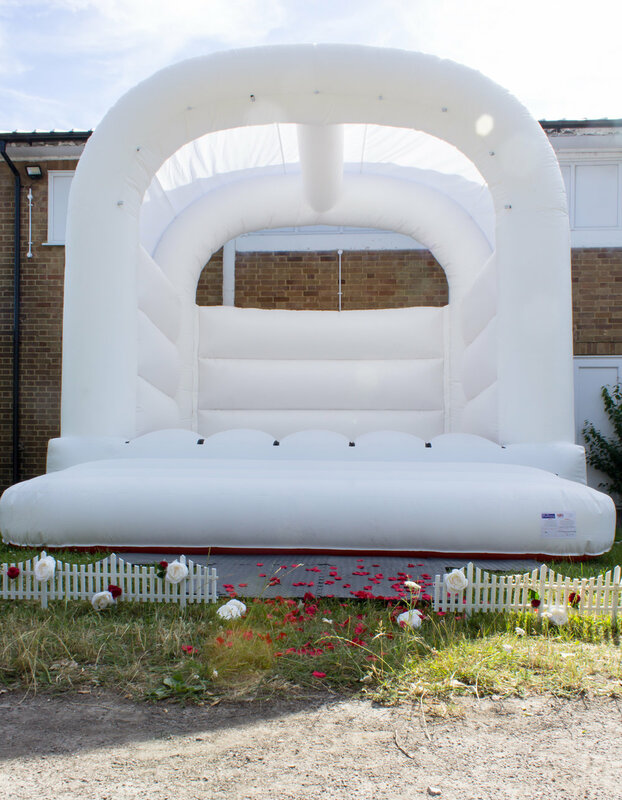 15x15ft white bouncy castle suitable for both adults & children. Most areas in the UK covered. However additional fees can apply for further travel. I always like to work to budgets so please get in touch. I'm always open to a challenge. Any other events you may need a helping hand with - book a consultation with me! See what I have to offer and see for yourself, the time, stress & money I can save you! "..and suddenly all the love songs were about you"